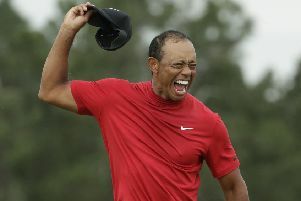 Two years after believing his career was over, Tiger Woods held his nerve on a wonderfully chaotic final day at Augusta National to win his 15th major title, and a first in 11 years, at the 83rd Masters. “Last year I was just lucky to be playing again,” said Woods. To have my kids there, it’s come full circle. My dad was here in ‘97 and now I’m the dad with two kids there. “The previous (champions) dinner I was really struggling, missed a couple of years of this great tournament and to now be the champion... it’s unreal for me to experience this. Woods bogeyed the 10th to fall two behind again but the wind was playing havoc on the daunting par-three 12th and Molinari, Koepka, England’s Ian Poulter and Finau all hit their tee shots into the water guarding the front of the green. Woods said: “I was just trying to plod my way around all day, all of a sudden I had the lead coming up 18 trying to make a five.